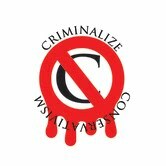 Criminalize Conservatism: America's Number One! Or Not? America's Number One! Or Not? "'The Global Competitiveness Report 2012-2013,' by the World Economic Forum, is the latest annual ranking of 144 countries, on a wide range of factors related to global economic competitiveness. 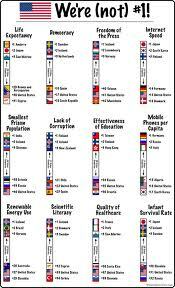 "On each of their many rankings, #1 represents the best nation, and #144 represents the worst nation. "Education in the U.S. is also mediocre. On 'Quality of Primary Education,' we are #38. On 'Primary Education Enrollment Rate,' we are #58. On 'Quality of the Educational System,' we are #28. On 'Quality of Math and Science Education,' we are #47. On 'Quality of Scientific Research Institutions,' we are #6. On 'PCT [Patent Cooperation Treaty] Patent Applications [per-capita],' we are #12. On 'Firm-Level Technology Absorption' (which is an indicator of business-acceptance of inventions), we are #14. "Trust is likewise only moderately high in the U.S. We rank #10 on 'Willingness to Delegate Authority,' #42 on 'Cooperation in Labor-Management Relations,' and #18 in 'Degree of Customer Orientation' of firms. "Corruption is apparently a rather pervasive problem in the U.S.
"On 'Diversion of Public Funds [due to corruption],' the U.S. ranks #34. On 'Public Trust in Politicians,' we are #54. On 'Irregular Payments and Bribes,' we are #42. On 'Judicial Independence,' we are #38. On 'Favoritism in Decisions of Government Officials' (otherwise known as governmental cronyism), we are #59. "On 'Organized Crime,' we are #87. On 'Ethical Behavior of Firms,' we are #29. On 'Reliability of Police Services,' we are #30. On 'Transparency of Governmental Policymaking,' we are #56. On 'Efficiency of Legal Framework in Challenging Regulations,' we are #37. On 'Efficiency of Legal Framework in Settling Disputes,' we are #35. On 'Burden of Government Regulation,' we are #76. On 'Wastefulness of Government Spending,' we are also #76. On 'Property Rights' protection (the basic law-and-order measure), we are #42. 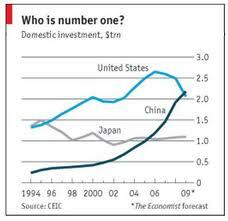 "Investors find somewhat shaky ground in the U.S.
"On 'Strength of Investor Protection,' we are #5. On 'Protection of Minority Shareholders’ Interests,' we are #33. On 'Efficacy of Corporate Boards,' we are #23. On 'Reliance on Professional Management,' we are #19. On 'Strength of Auditing and Reporting Standards,' we are #37. On 'Venture Capital Availability,' we are #10. On 'Intellectual Property Protection,' we are #29. On 'Soundness of Banks,' we are #80. On 'Regulation of Securities Exchanges,' we are #39. On 'Country Credit Rating,' we are #11. On 'Government Debt [as a % of GDP],' we are #136. On 'Effectiveness of Anti-Monopoly Policy,' we are #17. On 'Extent of Market Dominance,' we are #9. "Taxes also definitely don’t qualify as being good in the U.S. We rank #69 on 'Extent and Effect of Taxation,' in which the 'Effect' that’s considered is reducing the 'incentives to work or invest.' We are #103 on 'Total Tax Rate,' #47 on 'Number of Procedures Required to Start a Business' (which is an indirect tax), and #50 on 'Prevalence of Trade Barriers' (both tariff and non-tariff). 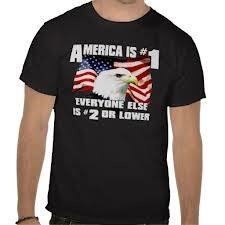 "The U.S, overall, is very far from being #1 – not really in contention, at all, for the top spot. The rankings suggest instead that this nation is sinking toward the Third World. The nations that stand high on most of these lists are Finland, Switzerland, Singapore, New Zealand, Denmark, Sweden, Norway, Japan, Canada, Qatar, Netherlands, Iceland, Ireland, and Hong Kong. "The nations that generally rank in the bottom half of these rankings are the ones that are typically cited as being 'Third World,' or poor." "On 'Organized Crime,' we are #87. "On “Soundness of Banks,” we are #80. "On 'Government Debt [as a % of GDP],' we are #136. Anything less than #1 is an anathema to Conservatives, and any mention of our qualifying for a lesser status is met by the usual sheeplet standby, "Why don't you leave the country?" 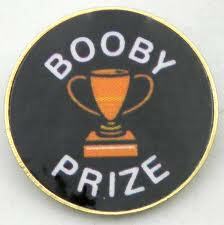 We'd see more improvement on competitiveness if the Conservative leadership left the country and the sheeplets entered a comprehensive program of re-education. Surely the figures for Education, while not of Third World status, are still abysmal: "On 'Quality of Primary Education,' we are #38. On 'Primary Education Enrollment Rate,' we are #58. On 'Quality of the Educational System,' we are #28. On 'Quality of Math and Science Education,' we are #47." While the survey was one measuring "competitiveness," a topic of interest to those in corporate life, we can't help but note that these measures were caused by those same corporate Conservatives, with the concurrent harm to the other 98%. It will be a frigid day in Hades when the "Total Tax Rate" jumps from #106 to #1, or "Organized Crime" moves from #87 to anything lower without criminalizing Conservatism. And until tax regulations are overhauled, especially in regard to loopholes and offshore havens, we'll still remain #76 on "Burden of Government Regulation" and "Wastefulness of Government Spending." It doesn't take much to realize how many of the business-oriented "competitiveness" categories can be improved by criminalizing Conservatism: it takes more to show people how real the Vast Right-Wing Criminal Conspiracy really is. For business majors in school, don't be too sure that the Republican Party is for you as you see that "On 'Diversion of Public Funds [due to corruption],' the U.S. ranks #34. On 'Public Trust in Politicians,' we are #54. On 'Irregular Payments and Bribes,' we are #42. On 'Judicial Independence,' we are #38. (And) On 'Favoritism in Decisions of Government Officials' (otherwise known as governmental cronyism), we are #59. * A piece, "It’s One Of The Craziest Internet Rumors About Guns. 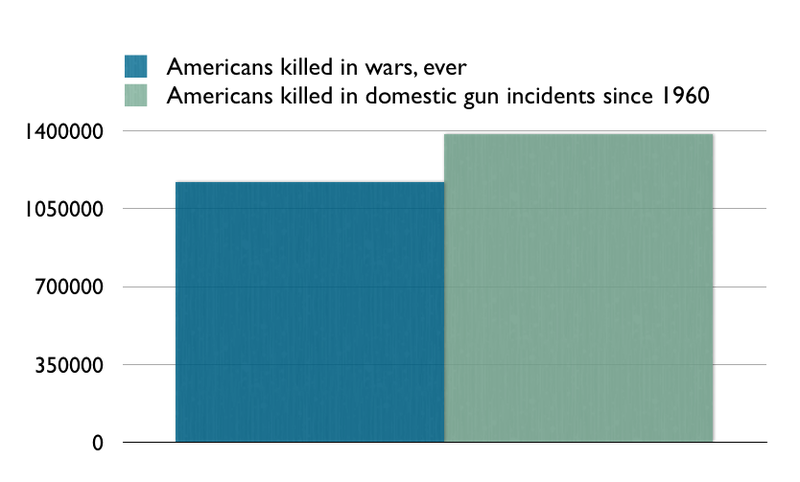 And As It Turns Out, It’s True," by Eli Pereser at Upworthy.com., revealed that "More Americans have died just since 1960 from gun incidents — suicides, accidents, and homicides — than died in every war in U.S. history. The deadliest war the U.S. has ever had is the war we waged against ourselves."